Think Lexus and what do you think? Reliable, comfortable, quality cars. You know what you’re getting with a Lexus. A car that will look good, is incredibly well made and has an abundance of the latest driver technology. Will a Lexus stir the senses? No so much. Then, that wasn’t the rationale behind the creation of the Lexus brand. However, times they are a changin’. Lexus has decided that its time the range received a little bit of the zing that the incredible LFA had in abundance. That model showed that not only could Lexus nail the high quality, premium sector; they also had a little touch of supercar in the DNA as well. 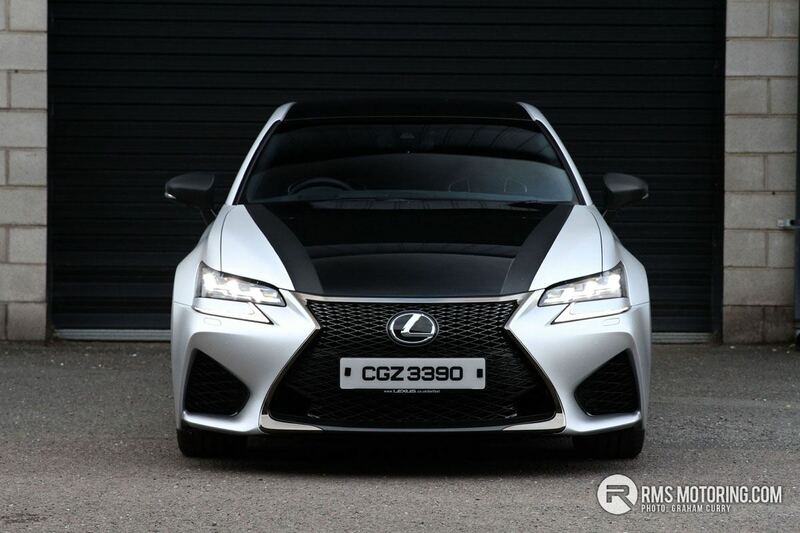 This has permeated its way through the model line-up and is clearly evident in the makeup of the GS-F. This is a GS, but no ordinary GS. F is for FAST. I didn’t know what I was getting into when Lexus Belfast passed me the keys. Well, I say keys, but you can actually use an app to unlock and start the car. But back to the main event – the GS range is Lexus’ largest saloon available and when the “–F” gets added to the name, it becomes insane. From the outside, its hard not to be drawn to the monstrous brake discs and huge orange Brembo brake calipers. 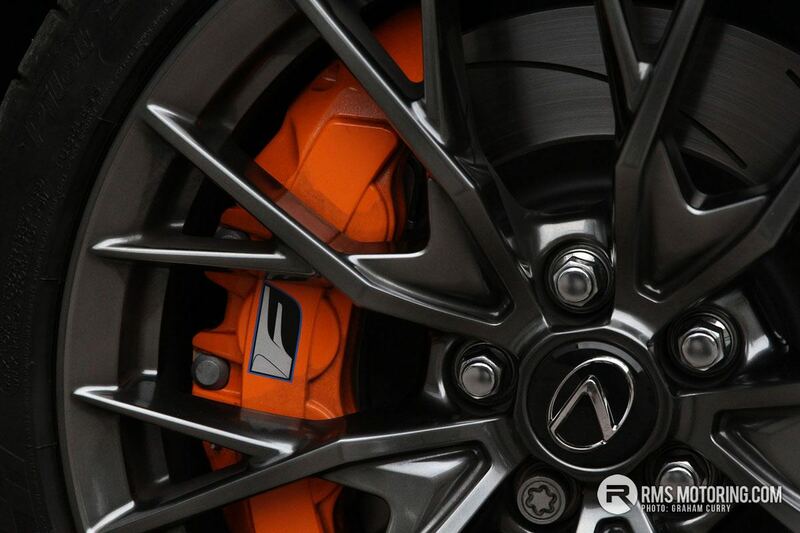 When was the last time the brakes on a Lexus caught your eye? This thing screams performance, which is underlined by the vented front wings and the carbon fibre enhanced front the bumper. 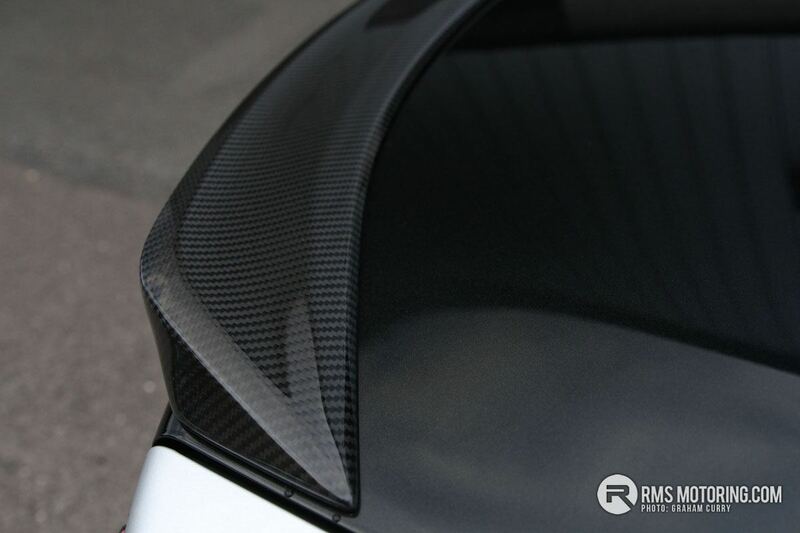 On the boot-lid there is a carbon spoiler attached which blends into the bright metallic black bootlid. Eight colours are available if black isn’t your thing on the GS-F. Personally, I think the standout the colour in the range is factory Solar Flare Orange. Opening the electric open/close boot-lid reveals a load space that is surprisingly superb for a saloon car and as the image gallery will show a microwave box fitted perfectly alongside my large camera bag with enough room left over for another few microwaves if required. Not being a golfer, it is hard to judge the scale of a set of clubs within a bag; however I would be pretty sure that at least one set will fit comfortably in the boot. For the wannabe continental road-trippers out there, there is most certainly enough room for a weeks luggage and a tent for an adventurous trip for four. I would have headed straight for the Stelvio Pass if Lexus Belfast would have let me. The car soaks up the miles with the ease of Mo Farrah but has the get up and go of Usain Bolt, when the right pedal is pressed. 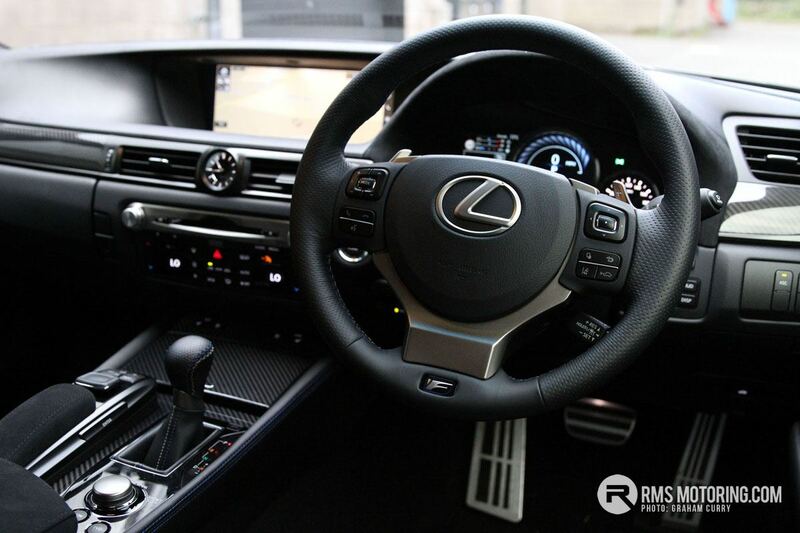 The cabin of Lexus models usually offer aesthetics and ergonomics in abundance and the GS-F is no different, if anything it goes that extra mile with a perfectly sumptuous blend of carbon, leather and alcantara throughout. 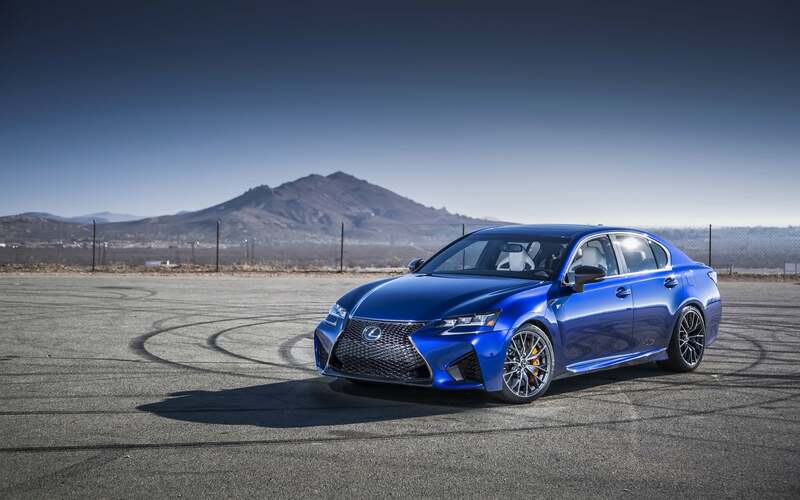 This blend of materials gives the GS-F a more edgier feel than previous Lexus interiors, which is in keeping with the rawer, racing ethos of this model. Alcantara and leather clad most of the interior with carbon inlays on the doors, dash and centre console finishing off the looks. The heated, cooled and electric memory front seats on this model tested are in black leather whilst there is an option for red or grey leather when ordering new. These seats are absolutely incredible, the feel and support of a proper sports bucket seat with the comfort expected from a Lexus, a combination that is rare with this type of seat. These seats, combined with the centre console layout and positioning of the steering wheel and pedals gives a real sports feel of being in a cockpit rather than just a cabin and a colour head up display is visible on the windscreen just above the ‘wheel. Comfort within the cabin is helped with dual climate control whilst the larger than life colour screen sunken into the upper dash is controllable via the remote touch interface control placed perfectly in reach just infront of the centre armrest. The touchscreen display dominates the cabin. At 12.3inches and fitted in landscape orientation I must say it was an attention grabber for anyone who wanted to get a feel for the GS-F when I had it. It felt as if a lap top was built into the dash and to be honest it also felt like the infotainment system offered as many options. Sat nav, radio, dab radio, Bluetooth, cd playback and usb connectivity are all part of the system with DVD playback available also. The screen has a split screen option, offering a vast array of views to best suit owners needs and this model tested is equipped with a Mark Levinson premium surround audio system option at £1000 and the quality is fantastic. The words I want to use to describe how this engine revs would see me in trouble and would fill the swear box very easily in the office, so I will try and put it politely. This V8 engine revs like WOW and goes like WOW with a huge amount of mid range get up and go like WOW! Selectable driving modes include ECO, Normal, Sport S and Sport + with each mode allowing differing engine map settings and characteristics according to the way in which you wish to drive it. 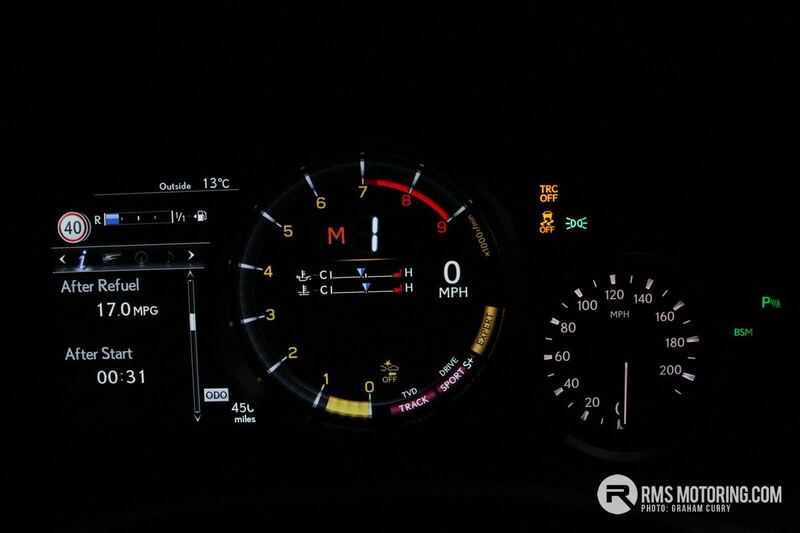 The driving experience is also race inspired with an adjustable tortque vectoring differential which allows changeable settings as follows; Standard, Slalom (more nimble steering response), and Track which offers the optimum and indeed with traction control fully deactivated offers “expert mode”. The GS-F offers outstanding power and handling for being such a large car with a perfect balance. Safety on the move is aided with adaptive cruise control, lane departure warning, lane keeping assist, auto high beam, 10 airbags and blind spot monitor to list just a few. 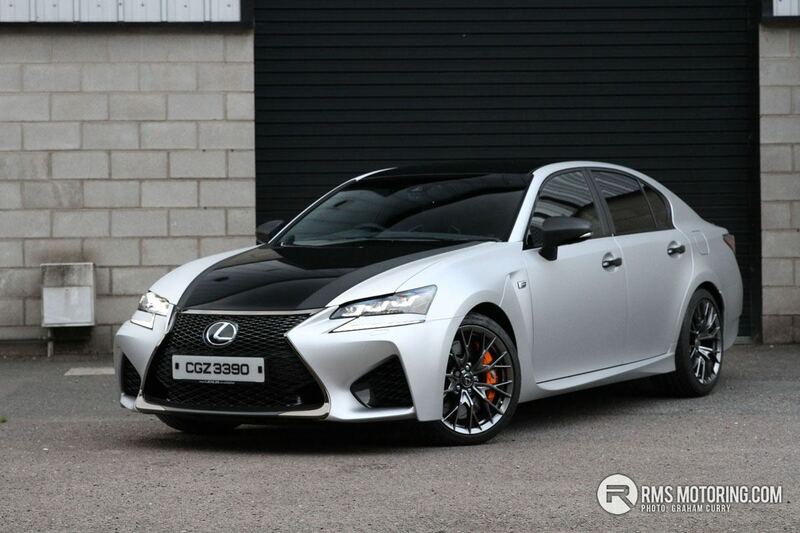 Starting at just shy of £70,000 the GS-F is seriously good value for money and unlike many European challengers has very limited options available meaning you won’t spend much more than another couple of grand on top of base price simply due to this Lexus having all the toys as stock rather than as options. The GS-F is clearly a statement of intent from Lexus and an attempt to take the brand in a new direction. I like this new direction and with the GS-F, you can get there rather quickly. why can't car manufacturers make cars with nice wheels any more? If I squint, the first picture, the silver and black one, looks to me like one of those diesel Jettas that people seem to be pimping lately. I don't count that as a good thing. And the wheels look like something that was in about 10 years ago. | If I squint, the first picture, the silver and black one, looks to me like one of those diesel Jettas that people seem to be pimping lately. I don't count that as a good thing. Aye but sure it looks sweet like.